WE ARE A PRIVATE GARDEN AND ACCEPT VISITORS FROM 8AM UNTIL NOON DURING BLOOM SEASON BY APPOINTMENT ONLY. PLEASE EMAIL OR CALL TO SET A DATE AND TIME FOR YOUR VISIT. WE ARE THE MOST SOUTHEAST GARDEN IN REGION 14 ZONE 9. 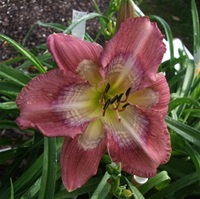 WE GROW MANY SHOW QUALITY DAYLILIES AND HAVE PRODUCED SEVERAL AHS AWARD WINNERS DURING OUR HYBRIDIZING EFFORTS. PLEASE CONTACT US ABOUT JOINING THE AHS. 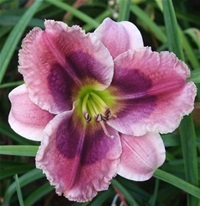 ONE OF OUR LATEST INTROS, A DIPLOID UNUSUAL FORM, THEY HAVE BECOME MY FAVORITE FORM OF DAYLILY OVER THE YEARS. WE CONTINUE TO WORK WITH DIPLOID UFs TODAY. I THINK WE HAVE PRODUCED SOME OF THE BEST NEAR WHITE UFs TO DATE AND ALL ARE IN GREAT DEMAND. WE ARE ALSO DOING PATTERN DIPLOID UFs AND RELEASED OUR FIRST 1N 2016 FROM OUR "LILLIAN'S VAPOR TRAIL" AND LARRY GRACE'S "WILD DREAMS" ( LILLIAN'S LEGENDS AND LIES )WHICH CAN BE SEEN ON OUR 2016 INTROS PAGE. WE ARE NOW FOCUSED ON PATTERNS WITH 90% BEING DIPS. OUR TET HYBRIDIZING IS ABOUT 10% OF OUR TOTAL EFFORTS TO PRODUCE NEW, DIFFERENT, SHOW QUALITY DAYLILIES THAT DO WELL EVERY WHERE. 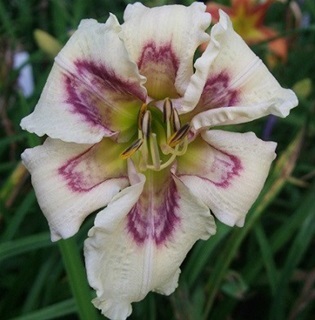 SEVERALYEARS AGO WE STARTED DOING SMALL DAYLILIES BECAUSE I HAD ALWAYS BEEN IMPRESSED WITH THE AMOUNT OF BRANCHING AND BUD COUNT ON THE ONES I GROW AS SHOW FLOWERS. I MADE A FEW CROSSES IN 2012 AND WAS VERY PLEASED WITH A COUPLE OF THE SEEDLINGS WHEN THEY BLOOMED IN 2013. I DID NO HYBRIDIZING IN 2013 DUE TO HEALTH ISSUES, IN 2014 I DID A LOT OF HYBRIDIZING WITH THOSE TWO SEEDLINGS AND SOME NEWER STUFF I OBTAINED IN 2013. WHEN THE SEEDLING BLOOMED IN 2015 I SELECTED AS MANY OF THEM TO KEEP AS I DID THE UFs. WE RELEASED THOSE FIRST TWO MINI'S IN 2016. 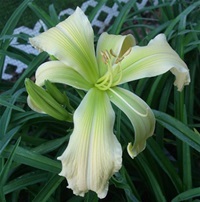 WE ALSO SELL SEED ON THE LILY-AUCTION STARTING IN MID SUMMER. beautiful flowers and great photography! I want to add this one to my order. Please remember, contact me from my contact page.